doodhi/kumro stands for pumpkin in Konkani/Bengali respectively. This is one of the very healthy vegetables and many people are unaware about its benefits.It is very low in calories and contains no cholesterol or saturated fats,instead its a rich source of fiber,minerals and vitamins. This veggie can be used to make different savory and sweet dishes.So here is a simple pumpkin recipe. Peel and chop the pumpkin and potatoes into small pieces(not very small). Chop the onions,beans and green chillies(slit). Take oil in a kadhai.Add the cumin seeds or pachforan(as said in bengali)Pachforan as the name suggests is a combination of 5 spices-cumin,black cumin(kalonji),fenugreek(methi),radhuni(similar to mustard),fennel(saunf). Add the green chillies,onions and saute. Add salt to cook faster. Add the chopped tomatoes and let it cook. 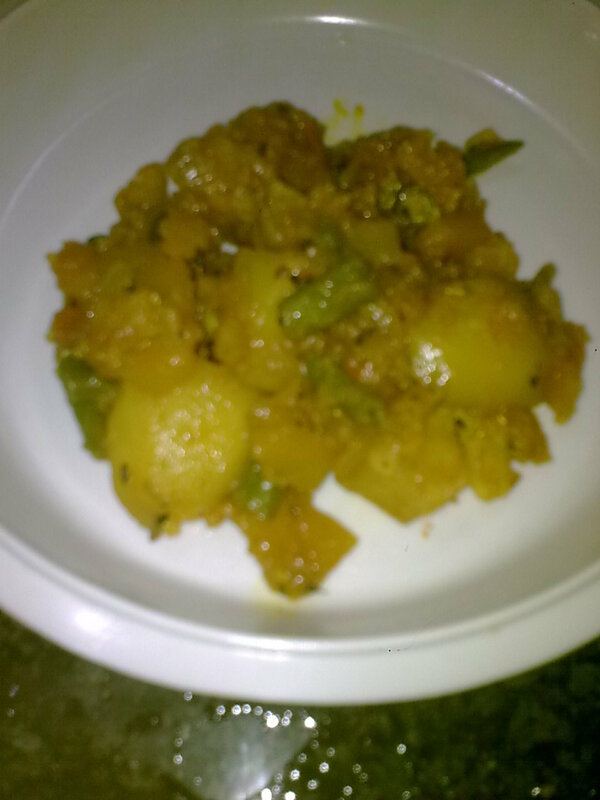 After 2-3 min add the pumpkin,beans and potatoes,add salt,haldi and a pinch of sugar and cover the lid and cook for 10 min. Once the veggies are partially cooked in steam, add water so that all the veggies are boiled. Let it cook till all the water is consumed. Note - beans are optional,you can also use capsicum in place of beans in case you have some.